...unless you're selling Christmas Mistletoe! 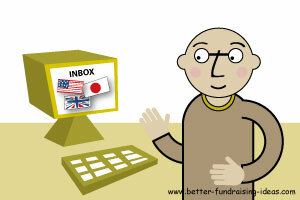 All the fundraising ideas on this page were submitted by visitors to this web-site. A really big thank you to the groups who have sent them in. This web-site is used by schools, churches, charities and sports clubs on every continent and your ideas will help people raise money for good causes around the world. What a great feeling to share ideas and tips with other people who, just like you, give up their time to get involved and try to make a difference!